Professional sprinkler system installation by Kable Landscaping keeps your lawn and garden properly hydrated, conserves water, and frees you up to do things you like to do. 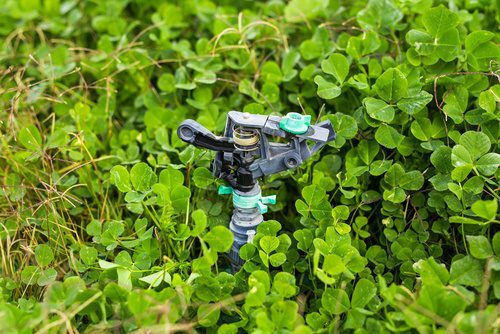 Sure, you could purchase a sprinkler head from a big box store to water your green spaces, but these aren’t as efficient as a professionally installed sprinkler system; they also can’t guarantee full coverage of the area you want to water. Stop dragging the hose around your yard or grounds daily and constantly adjusting the sprinkler position to ensure all of your foliage is getting watered. Contact Kable Landscaping about professional sprinkler system installation for your home or business. We also perform sprinkler system maintenance and repairs, spring startups, and winterizing. Call on us for all of your sprinkler system needs. Sprinkler systems provide a number of benefits for your home or business. When you contract Kable Landscaping for sprinkler system installation, you can count on an honest quote, friendly service, and a job well done by skilled professionals. We take measures to disturb as little of your existing landscaping as possible and leave your grounds looking like we were never even there. All that will be left is for you to reap the benefits of your new sprinkler system. Your lawn and foliage will respond with vigorous and healthy growth given regular irrigation at optimal levels. Beyond a lush, beautiful lawn and blooming foliage for curb appeal, a sprinkler system makes your home more appealing and more valuable when you are ready to put it on the market. Disperse water onto your landscape at just the right amount and at a specific time. If rain falls, sprinkler systems can come equipped with sensors that automatically detect natural moisture, which keeps the sprinkler from turning on. The math is simple: less water used means lower water bills. Call Kable Landscaping today at (989) 695-5222 to talk to us about a sprinkler system installation for your home or business. We look forward to hearing from you!